Soak the stale bread in water for 5-10 minutes and squeeze dry. Place the tomatoes in boiling water for a few minutes until the skin starts to split. Skin, de-seed and roughly chop. 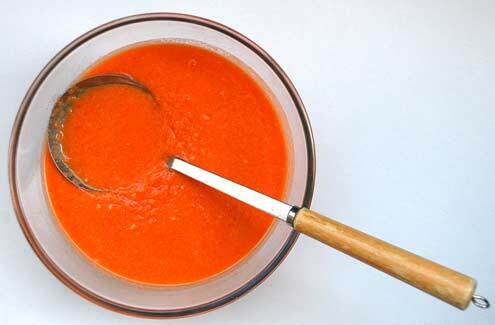 Put the tomatoes, bread, cumin, salt and garlic in a food processor and blitz until smooth. With the machine still running, slowly add the oil and then the vinegar. Switch off and add enough water for your preferred consistency. Ladle into bowls and add a spoonful of the garnish. 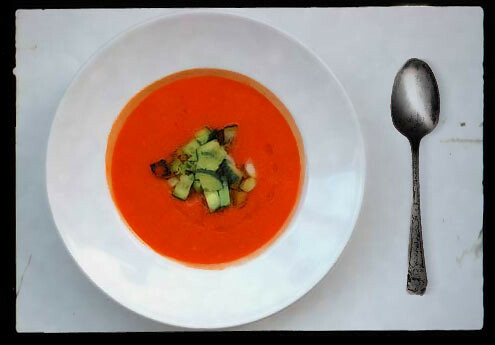 Verdict: There are few things in life better than gazpacho. Delicious beyond description. Drink: A trio of cold lagers in a pair of local pubs. Entertainment: ’24’, series one, 20:00 to 22:00. Everyone has been kidnapped (again). Dennis Hopper has a weird Bosnian/Welsh hybrid accent. I just made mine with yellow tomatoes. Yellow tomatoes? You crazy fool.